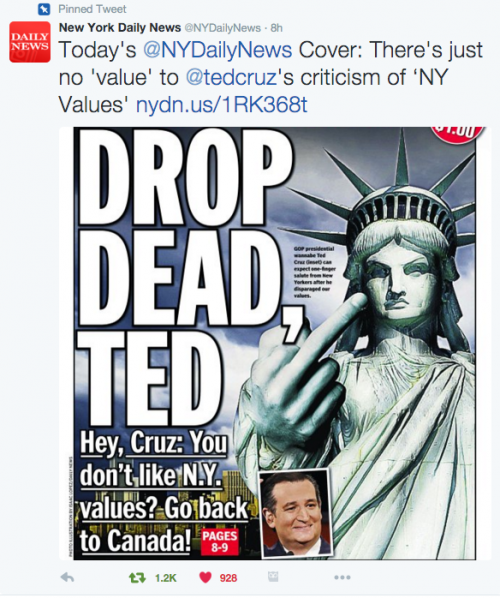 Drop Dead Ted: You don’t like NY values? Go Back to Canada! That’s the cover of NY’s leading tabloid, The NY Daily News, in response to Ted Cruz disparaging NY values in the last (thank God!) Republican debate in the 2016 Presidential Race. We’re sick of these GOP clowns. We don’t need to see them again!